So within the next week, I am finally going to start working on my next brand-new book. It’s exciting. I’m excited. Are you excited? I’m excited. With the completion of the big restoration project I’ve been on, including re-editing all my books and getting brand new covers for all of them, I’ve had to turn my focus onto another big part of my work, which is the publishing business itself. For those who don’t know, I write AND publish AND market AND sell my own books, and for about a year and a half now, I’ve been doing it well enough to earn a living at it. Now, I am also in the process of growing and expanding my business, I have multiple people who work for me on a freelance basis and as of the last few months, my wife works WITH me on a full-time basis. I don’t really honestly enjoy it very much. And this time around, I’m finally realizing that I’m probably not actually very good at it. Before I was an author, I worked in film, and I got to direct several amazing films with amazing cast and crew. When you’re directing a movie, everyone shows up already knowing their job and what they’re supposed to be doing. Your job is just to DIRECT their actions to result in an excellent final product. I love that. I love working with people who are already more expert in their field than I am and steering the ship towards a known end. However, it turns out that that is USUALLY not what running a business is like! In my experience. My wife has the patience of a saint. I mean, obviously, but particularly now. Because I just kind of keep … expecting her to know how to do everything I was doing before she showed up. And that is completely not fair of me. If she were not my wife, I’m sure I would have driven her to quit several times over. When you’re building a company, you can’t just grab someone off the street and plop them down in a chair and say, “Hey, do the thing,” and then expect them to know how to do it automatically. There has to be training, and a breakdown of duties, and monitoring, and further instruction. Yes, obviously in a perfect world you would hire people for positions who already have some experience in those positions. But that isn’t always possible, especially when you’re in an industry like this one, which is so new that it’s practically impossible to FIND anyone who has, like, years of experience. Whenever I’ve worked for people in the past, if there’s not, like, clear training on what to do, I’ve tended to just jump in and FIGURE EVERYTHING OUT. But what I’ve always been really terrible at is creating a position that someone ELSE can step into. Every time an organization has tried to replace me, it was always a bit of a mess. Because when the new trainee said, “Garrett, how do I do this?” my response was always, “I don’t know, I just kind of waved my hands at it until it did what I wanted it to do. Turns out that can be a great way to start a business, but a terrible way to run one. And maybe that’s why I wasn’t always the best employee! Honestly, now that I’ve realized this, it already feels a little bit easier to confront. Like, just recognizing the issue makes it less of an issue. Because now I’m no longer getting frustrated trying to do everything myself—I’m trying to figure out how to be a good teacher, so that I can have a team of people who know what they’re doing better than I do. 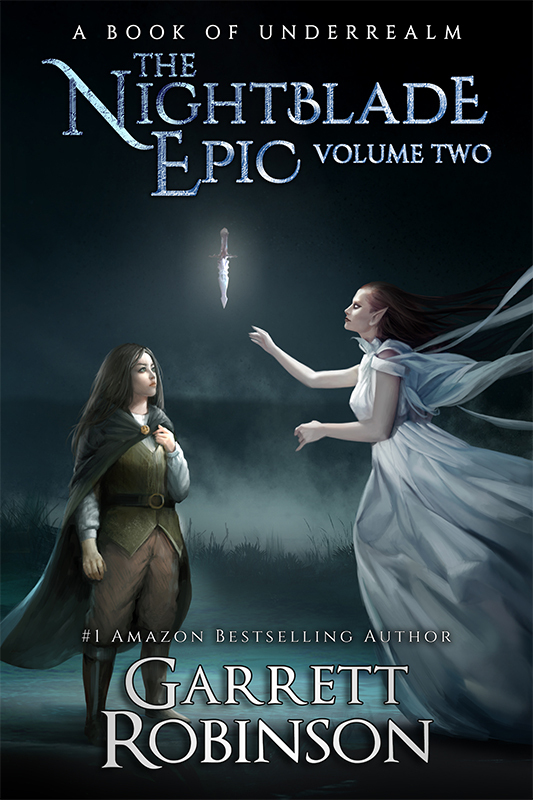 That’s what I’ve got for you today, Rebel, but I wanted to let you know that three days ago The Nightblade Epic, Volume One came out as an audiobook. Amazon’s got this incredible program called Whispersync where if you bought the ebook version—or if you buy it now—you can actually get the audiobook version for, like, less than four dollars. That’s insane. You can go pick it up at the link in the description. And if you already bought the ebook, but want to give the audiobook a try, you can, for again, like, less than you paid for the ebook itself. And that truly is all I have for you today, Rebel. Subscribe if you haven’t already, maybe check out another video from the channel up there or click down there to check out my Patreon and see my secret videos.